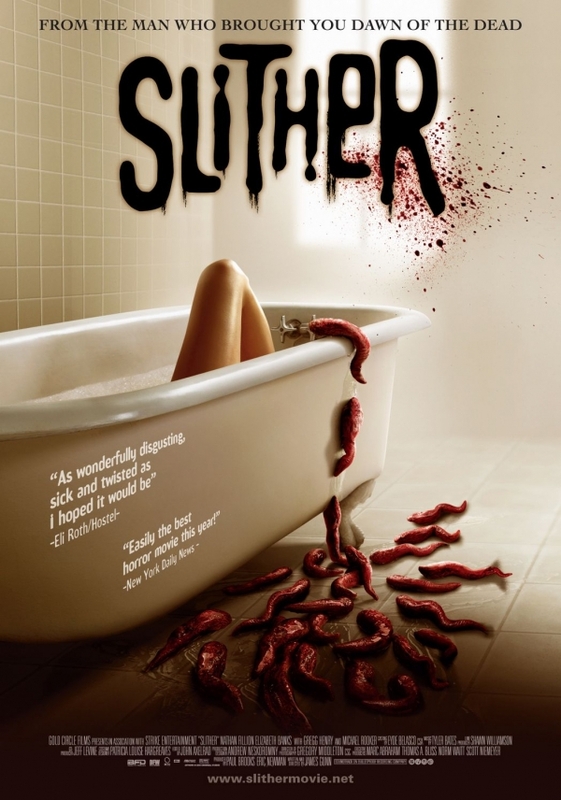 Part fifties drive-in sci-fi, part eighties splatter comedy, James Gunn's loving schlock homage SLITHER is all fun. The story begins when a meteor crashes through earth’s atmosphere, bringing with it a killer space slug or something like that. Grant Grant (Michael Rooker), who obviously has never seen THE BLOB, pokes the slug with a stick. Bad idea, as this results in the slug, which is apparently pretty smart as far as slugs go, taking over Grant’s body. At first Grant's wife Starla (Elizabeth Banks) doesn’t notice much difference. However, when Grant starts developing a serious case of space acne and a taste for the neighborhood pets, Starla begins to suspect something may be wrong and calls in sheriff Bill Pardy (Nathan Fillion). From this point on the movie is pretty much non-stop action, humor, and slime. The filmmakers deserve a big “thank you” for doing most of their effects using old school makeup, latex, and buckets full of real goop and only using CGI sparingly. The Michael Rooker space slug is the best horror movie monster in ages, and a large part of that is because you can actually see a person acting beneath the goo. You just don’t get that with computer generated creatures. Gunn got his start working for Troma films, the folks responsible for such cinematic classics as THE TOXIC AVENGER. He later went on to write the screenplays for the 2 live action SCOOBY DOO movies and the DAWN OF THE DEAD remake, but I won't hold that against him. Anyway, SLITHER is basically a Troma film with a modest budget and real actors. It's still an unapologetic ‘B’ movie, so don’t go in expecting to be blown away by its originality or looking for deep meaningful themes. Sure, we've seen this premise before in Fred Dekker's NIGHT OF THE CREEPS, Jack Sholder's THE HIDDEN, and no doubt other films I'm forgetting. But thanks to Gunn's clever writing and solid direction and a great cast, it winds up feeling surprisingly fresh. Great review. I totally agree with you. This movie had a great script that was pulled off wonderfully by some great actors. They were able to be serious without being so serious to kill the humor. I think this movie plays an important role in the horror genre beyond just another zombie/alien flick. I call it the King of the B-Reels. I go into more depth in my own review. If you have time you should check it out and tell me if my ideas hold up.